People don’t often write letters to each other anymore. It’s an art that is dying. And an art it is. The hand that chooses the paper, the ink, the envelope, choosing the typeface, the action of the writer to drag the pen across the page, all these details are carefully crafted to convey a message from one person to another. 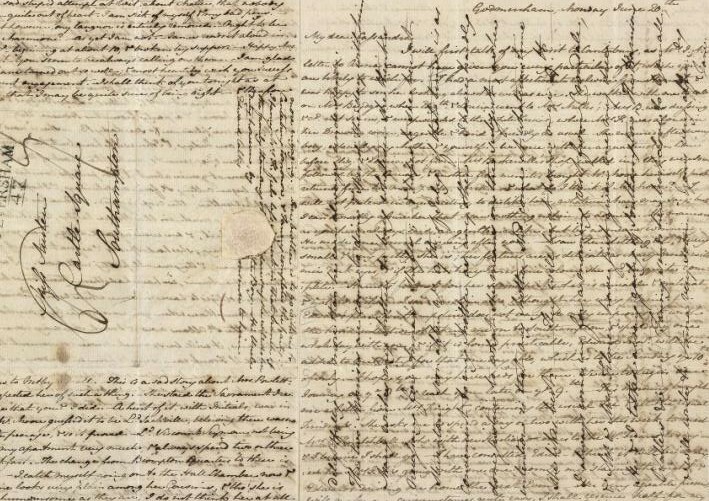 Jane Austen wrote so many letters and paper was so precious that she often wrote in both directions on the page. And every available corner was filled by her tiny script. After her death, her sister Cassandra burned many of the letters she received from Jane. The image above is an example of a letter Jane Austen penned. You will soon be crafting a letter to me and I hope you have as much fun creating it as I will have when I read them. So, go on, tell me about yourself in your letter. If you were stranded on a desert island, what 3 things would you have with you? What characteristics do you most like about yourself and your friends? This article was written on 16 Jan 2013, and is filled under Homework Assignments.